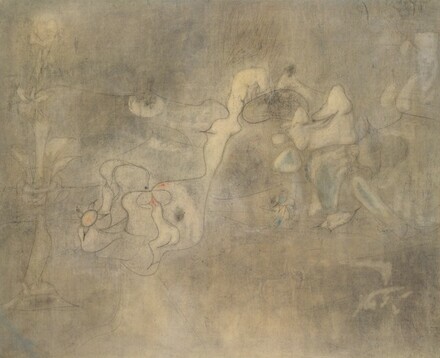 Estate of the artist; (Sidney Janis Gallery, New York); Mr. and Mrs. Paul Scott Rankine, Washington, DC; (Stephen Mazoh & Co., New York); purchased 1971 by NGA with funds from the Avalon Foundation. Graphic Survey Show, National Gallery of Art, Washington D.C., 1986-1987. Arshile Gorky: The Breakthrough Years, National Gallery of Art, Washington, D.C.; Albright-Knox Art Gallery, Buffalo; Modern Art Museum of Fort Worth, 1995-1996, no. 38, repro. (shown only in Washington and Ft. Worth). A Century of Drawing, National Gallery of Art, Washington, 2001-2002, no. 79. Arshile Gorky Drawings Retrospective, Whitney Museum of American Art, New York; The Menil Collection, Houston, 2003-2004, no. 100. Arshile Gorky, A Retrospective, Philadelphia Museum of Art; Tate Modern, London; The Museum of Contemporary Art, Los Angeles, 2009-2010, no. 146, repro. (shown only in Philadelphia). Carmean, E.A., Jr. and Eliza E. Rathbone. American Art at Mid-Century: The Subjects of the Artist. Exh. cat. National Gallery of Art, 1978: fig.13. Waldman, D., Arshile Gorky, 1904-1948 : a retrospective. New York, 1981: 202. Walker, John. National Gallery of Art, Washington. Rev. ed. New York, 1984: 686, no. 1109, color repro. Arshile Gorky: The Breakthrough Years. Exh. cat. National Gallery of Art, Washington; Albright-Knox Art Gallery, Buffalo; Modern Art Museum of Fort Worth, 1995-1996: no. 38. A Century of Drawing. Exh. cat. National Gallery of Art, Washington, 2001-2002: no. 79. Taylor, Michael R. ed. Arshile Gorky: A Retrospective. Exh. cat., Philadelphia Museum of Art; Tate Modern, London, England; the Museum of Contemporary Art, Los Angeles, 2009-2010, no. 49.